If there’s one place made to whoop it up and celebrate a half-century milestone, that place would be Las Vegas. That’s why it’s fitting that the National Recreation and Parks Association’s annual conference will take place at Mandalay Bay Sept. 15–17, during the organization’s 50th year of serving parks and recreation professionals. An anniversary cake with candles, interactive games on the exhibit floor and special cash and prize drawings are some of the events slated to mark the milestone. Add to that the fact that the conference will have hundreds of educational sessions — including 20-minute speed sessions, where you’ll learn a new idea in practically an instant — preconference sessions, local tours and networking opportunities, and the NRPA 2015 conference becomes easily the most worthwhile conference parks and recreation professionals will attend this year. In addition to a distinguished keynote speaker, several other knowledgeable and successful industry leaders will help attendees look at their facilities and programming in a new light. They include Mark Hall Patton, from television’s “Pawn Stars,” who will discuss how museums fit into parks and recreation departments; and ESPN reporter Tom Farrey, who is also the executive director of The Aspen Institute and will give an update on its Project Play and the Future of Play. NRPA is also proud to announce that the director of the National Park Service, Jon Jarvis, will be the featured George Butler Lecture Series speaker during the week. Pre-conference business will include CPSI Recertification and Aquatic Facility Operator courses and exams, and information about the CPRP certification. Also getting underway a day or two early will be some of the off-site tours, including to Floyd Lamb Park, the Las Vegas Aquatics facilities and Craig Ranch. There will be a presentation on building and mailing sustainable efficient facilities, turns to the Hoover Dam and a look at the back-of-the-house of local casinos. 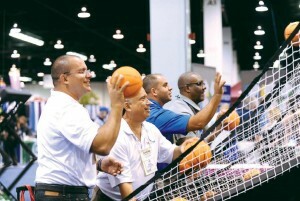 The NRPA knows how to have fun, and the fi rst place it will let loose is on the exhibition floor. As always, the newest fun activities and equipment for parks facilities will be on-site, ready for everyone to try them out. 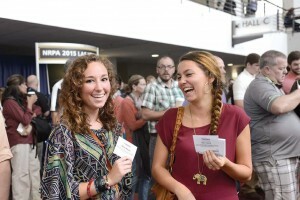 The exhibit hall will be open from 10 a.m. to 4:30 p.m. Tuesday and Wednesday, Sept. 15–16. Don’t miss this fantastic opportunity for education and networking, and the industry’s largest trade show. For more details, justification tips and registration forms, visit www.nrpa.org/Conference2015.